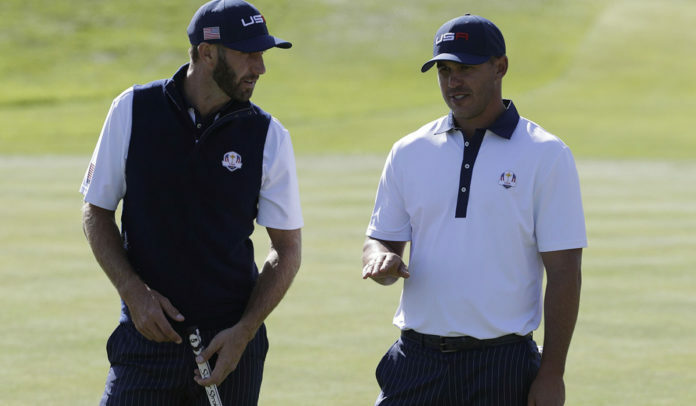 The ‘Bash Brothers’ Dustin Johnson and Brooks Koepka increased the critical evaluation of the failed US bid to retain the Ryder Cup after fresh drama in the wake of Sunday’s loss. The pair, close friends and gym partners, joined Team Europe in the hours that followed their win before coming close to blows. Reports confirmed that Johnson and Koepka had to be separated following a row late on Sunday. Johnson, the world No 1, and Koepka, who won two Majors in 2018, share personal trainer Joey Diovisalvi and have become close friends since the latter player’s emergence as one of the stars of the PGA Tour. The duo were paired together for Saturday’s foursomes but failed to register a win after a 2 & 1 loss to Henrik Stenson and Justin Rose. Following Sunday’s incident, Johnson’s partner Paulina Gretzky deleted any reference of Koepka from her social media account.